Deep in Rwanda's steep-sloped forest, the mountain gorillas look both endearing and intimidating. A tourist might feel conflicting impulses to shy away and reach for a hug (the latter is not advised) when a gorilla brushes past on a path. The way a gorilla snoozes, scratches a leg or casts an inquiring glance — it all seems familiar, and yet wild. "You can't tell what they're thinking," said John Scott, a retired chemical engineer from Britain's Worcester area who trekked to the high-altitude habitat to see the creatures with close genetic links to humans. 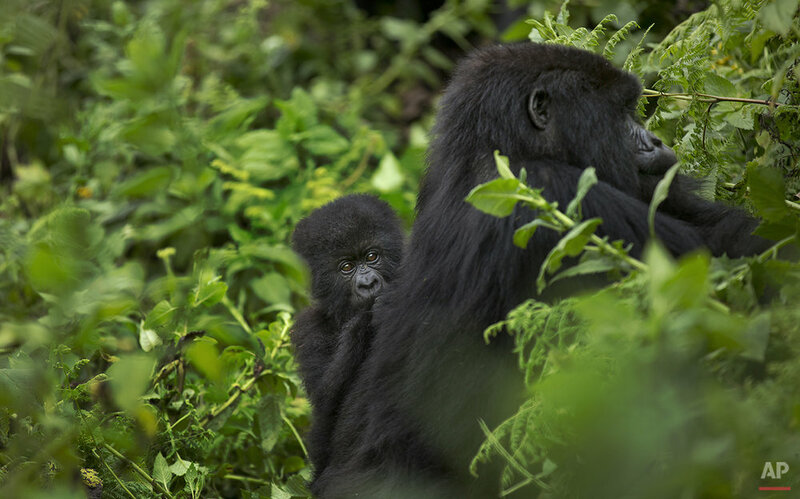 This sense of kinship helps explain why increasing numbers of tourists are heading to Rwanda's Volcanoes National Park, fueling an industry seen as key to the welfare of the critically endangered subspecies as well as the national economy. Those visitors can also be a threat because gorillas are vulnerable to human diseases and so reduced in numbers that a veterinary team called Gorilla Doctors cares for sick and injured apes. More than 20,000 people visited Rwanda's gorillas in 2014, nearly three times as many as in 2003, according to government figures. Many came from the United States, Britain, Australia, Germany and Canada. 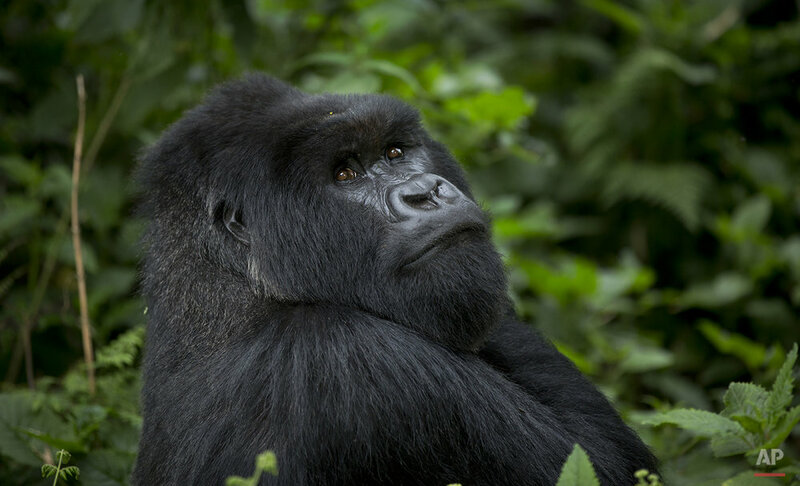 Last week, people in hiking gear sipped coffee and milled around at the park headquarters before breaking into groups of eight, the limit for tourist parties visiting separate gorilla families in the dense undergrowth. "How's the pace? Are you feeling the mountains yet or not?" guide Ferdinand Ndamiyabo asked his group, including an Associated Press team, during a hike up a volcano that is home to a family of gorillas called Amahoro, which means "peace" in the Rwandan language. It took close to two hours of walking to reach the gorillas, a relatively gentle climb in mild weather through tangled vines, stinging nettles and other lush vegetation. Ndamiyabo earlier laid out rules for the encounter: Don't point, speak softly, don't cough or sneeze in the animals' direction and stay a minimum of 23 feet (7 meters) away. If a gorilla approaches, crouch down, don't make eye contact and make a low sound similar to that of clearing the throat, which gorillas use to express friendliness. "The silverback is saying, 'No problem, my friends, take as many pictures as you want,'" Ndamiyabo declared. Another member of the group is Kajoriti, a male who lost a hand to a poacher's snare. American researcher Dian Fossey, who won the confidence of gorillas by imitating their noises, moving on her knuckles and chewing on vegetation, brought international attention to the primates' plight. Fossey, whose book "Gorillas in the Mist" inspired a movie starring Sigourney Weaver, was murdered at her Rwandan research camp in 1985 and is buried at a mountain gravesite. Rwanda descended into bloody chaos during its 1994 genocide, and tourism only returned to Volcanoes National Park at the end of the decade. Since then, Microsoft co-founder Bill Gates and Hollywood actors are among those who visited Rwanda's mountain gorillas, whose home is a two-hour drive from Kigali, the capital. The gorillas seemed so human — whether "grooming or passing wind" — but also huge and powerful, she said, adding: "One swipe of the hand and that's it." 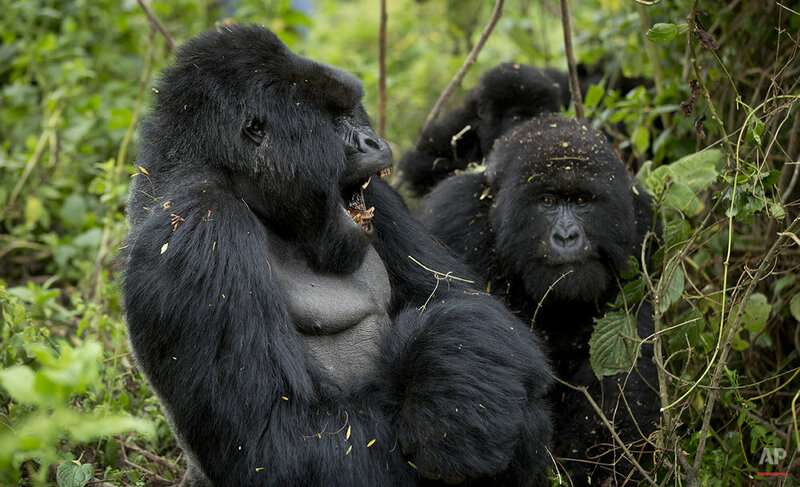 Text from the AP news story, Rwanda: Tourists Marvel at Gorillas Whose Numbers Are Rising, by Christopher Torchia.